Right on the waterfront, these homes are unlike any in London. Contemporary comfort and stunning river views are a given. If you can bear to leave the apartment, residents’ club membership is your passport to a lifestyle of good food, culture, entertainment and wellbeing. Part of a family of five, these glass and stone prisms have been constructed by US architects SOM to maximise exposure to every drop of light, air and water. Peace can be found in quiet gardens on sky terraces, where exhilarating viewpoints are never far from sight. State of Craft have created interiors that provide a sanctuary from life outside the home. Full-height windows bathe living spaces in unobstructed light. Oak timber, leathered stone and honed marble add layers of cool, crisp calm. We all want to connect to others, and that means different things to different people. Our digital app puts life on the Peninsula at your fingertips. For those who prefer a more human approach, your neighbourhood host is the friendly face on your doorstep. Then there’s The Upper Riverside Club with private cinemas, library and roof gardens - and Renew, your fifteenth-floor wellness suite, where city skyline views are the most natural of ice breakers. 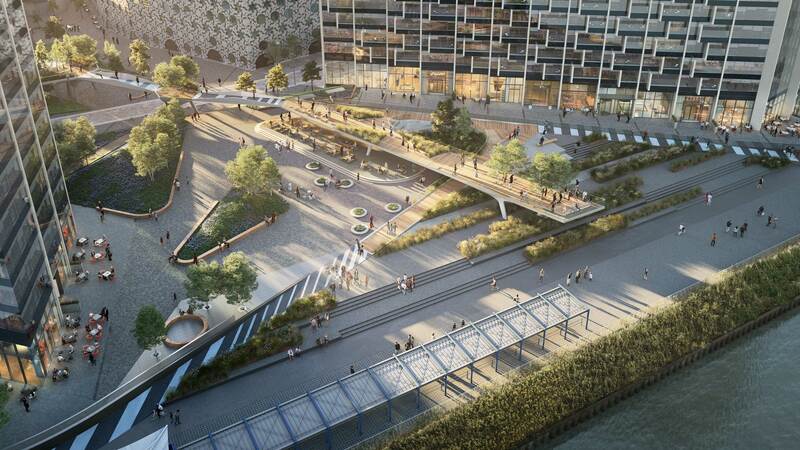 Two minutes from the tube, Upper Riverside will boast a mix of innovative architecture, green riverfront walkways and a revolving cultural programme. Five new towers, shaped like prisms, will offer sky-high homes right on the water’s edge and a string of eclectic cafes, bars and restaurants.